These shorts come from the same fashionable designs that PGA pro John Daly has been wearing almost exclusively. I'm not sure what he's up to, but they certainly get your attention. Unfortunately for John, his outfits are getting more attention than his golf game. Although he has managed a few low rounds here and there -- in events he's allowed to play because of sponsor's exceptions. If you are the jokester in your foursome then these are the shorts for you. And you have plenty to pick from. There are many different designs and styles, from these "Tooth" patterns (which remind me of my last root canal) to "Raspberry Surebet" and "Disco Balls Black" (you can make up your own joke here -- I'd only get censored). Also check out the stylish pants (ahem). 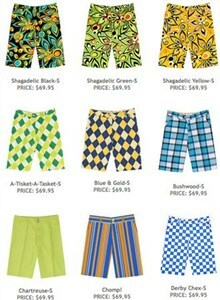 Here is a lovely pair: The Loudmouth Golf Shagadelic. (Yeah, baby.) These also double as camouflage. That is, if you are trying to blend in a Jim Morrison acid trip.